CycleBar is a new concept in premium indoor cycling that offers luxury amenities, mind-blowing playlists, and invigorating rides led by the most inspiring people in the business – it’s essentially a high-energy workout in a concert-like atmosphere! We will be opening mid-February, 2017 at 11104 N. Port Washington Road, Mequon, WI 53092. Once open in mid-February, CycleBar Mequon will provide an all-encompassing and community-centric program for those looking to simultaneously get fit and have fun. Classes will be held in a state-of-the-art stadium-style theater with three tiers of 48 bikes available for clients to ride! Riders will be able to track personal performance data via CycleStats™ and will have the opportunity to download the music played in every class attended. 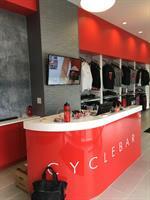 CycleBar Mequon will provide clients with complimentary fresh fruit, water bottles, towels and spin shoes for each and every class! Cyclebar Mequon also has a community room that you can use after rides for continued gatherings, or even a happy hour! What could be better than a heart-pumping workout followed by drinks with friends? !